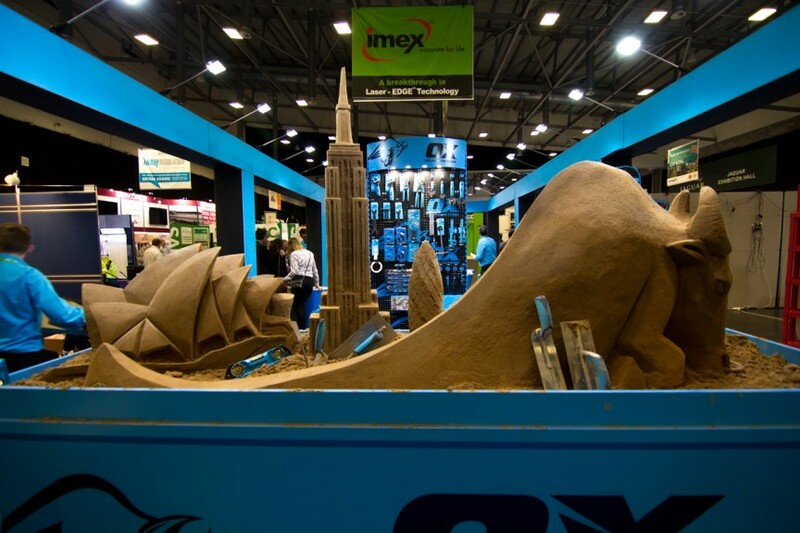 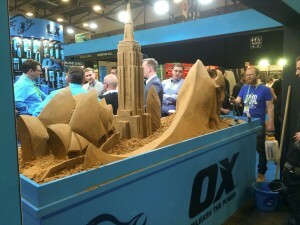 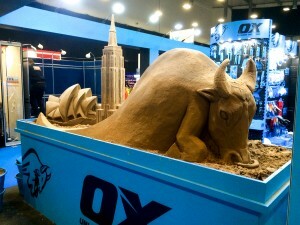 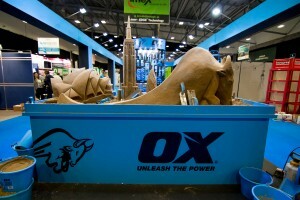 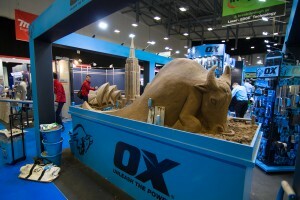 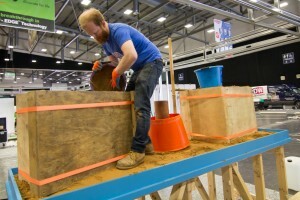 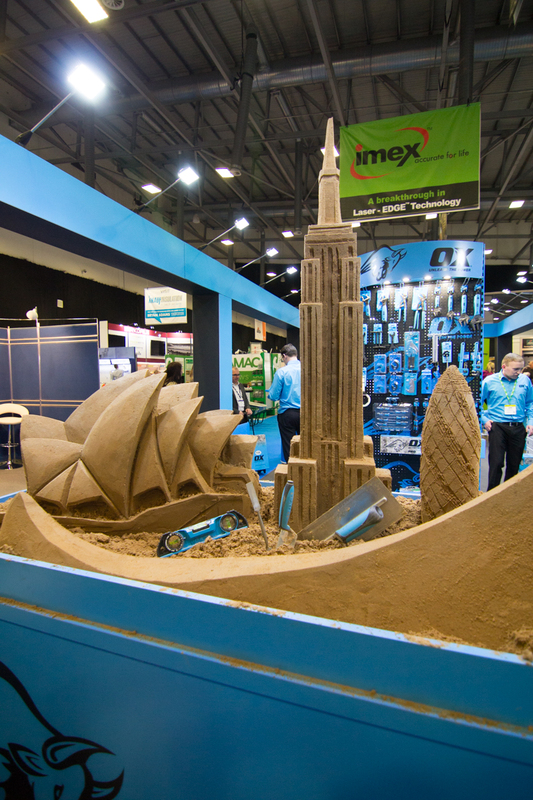 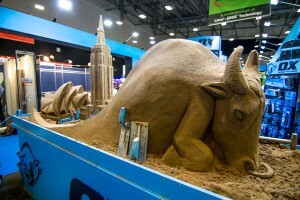 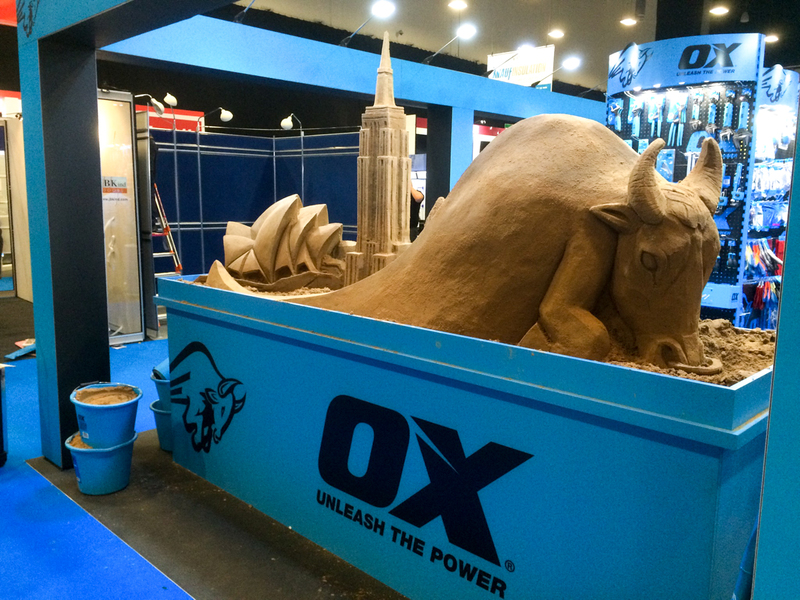 A Trade Show, sand sculptures, buckets and a van with Ox Tools. 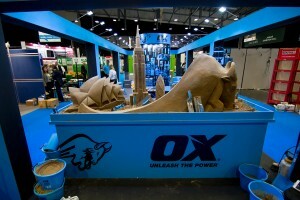 A Trade Show, sand, buckets and a van with Ox Tools. 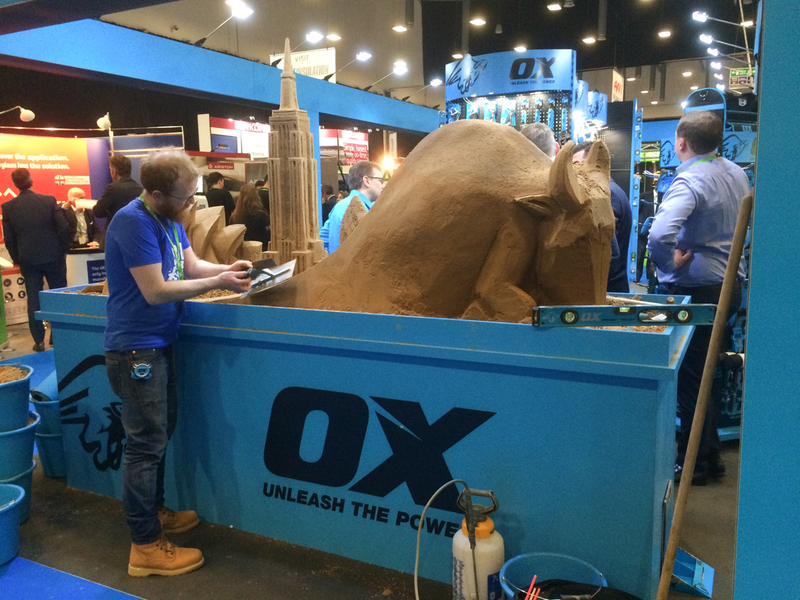 When Lee from Ox Tools approached us to work with them at a trade show event at the Rioch Stadium in Coventry, we were delighted to have been recommended by a good friend of Jamie’s, US sand sculptor, Kirk Rademaker. 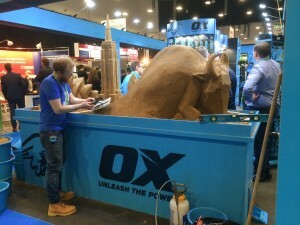 Ox Tools are a Australian based tool company that over the last few years have been expanding rapidly on a global scale. Our good friends at Uriah Woodhead in Bradford stock the tools and Tracy had been shown the team images of some of our sand sculptures in the past, so it was lovely to finally get to work with them. 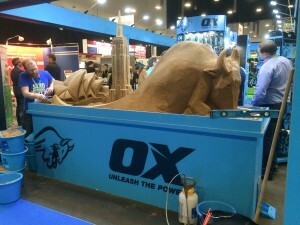 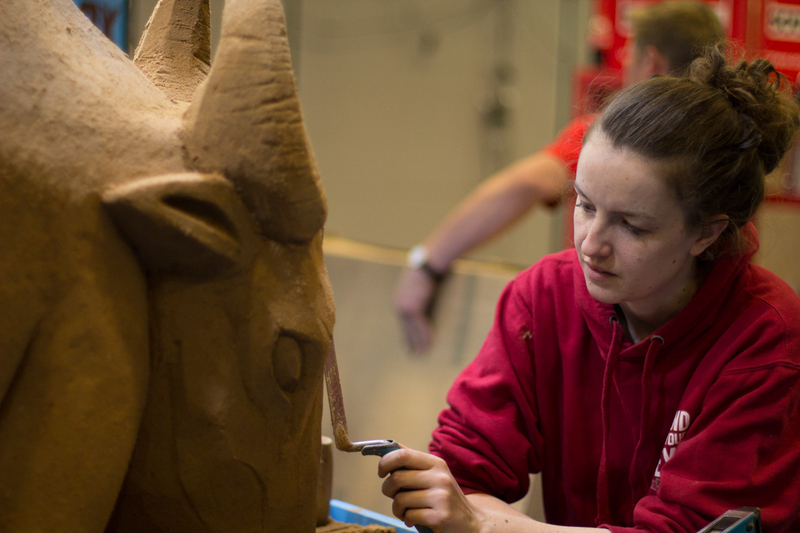 Jamie created a design for the sculpture which contained a large Ox and landmarks from the UK, Australia and America to show how OX Tools is now becoming a globally recognized brand. 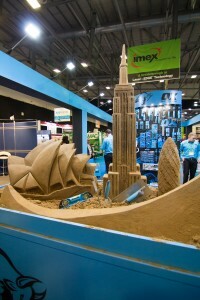 We would make the sand sculpture using their tools and I have to say, they are very nice tools indeed! 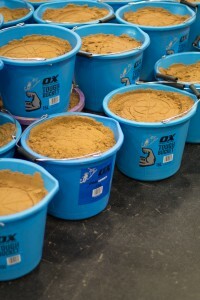 We decided to try something new and pack everything we needed into one van load, including the sand! Usually on events, the organizer, with our advice, has the sand delivered before the event and then arranges to have it removed after the event. 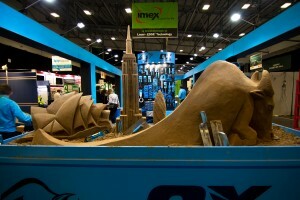 We wanted to look at a way of being able to offer a sand sculpture product on occasions when this is not an option. 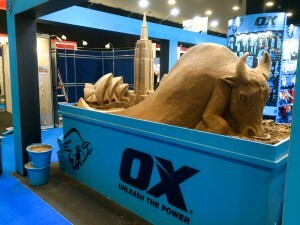 A stress free way to book us as sand sculptors. 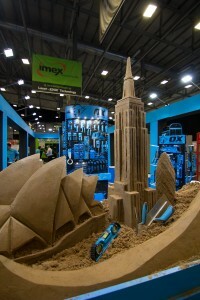 We bring everything we need with us and take it away again after the event. 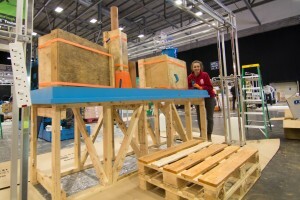 On the morning of the set up day, Jamie Wardley and myself, Claire Jamieson set off down to Coventry with a fully loaded van. 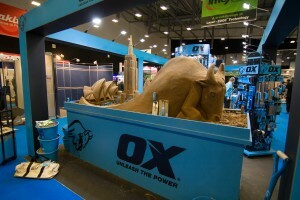 When we arrived at the Rioch Arena we received a warm welcome from the Ox Tools team. 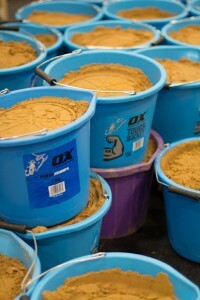 We unloaded the van and we were ready for compaction. 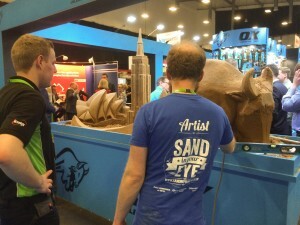 As we have used the sand before, on the Bradford Sand Sculpture Trail, we knew the sand very well, so compaction was much less stressful than usual. 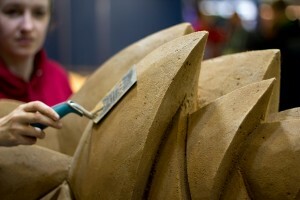 We then began to sculpt to get a good start on the next day when the visitors would arrive at the trade show. 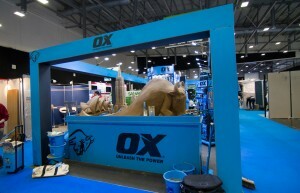 All the time the guys from Ox Tools were working hard building the stand and setting up. 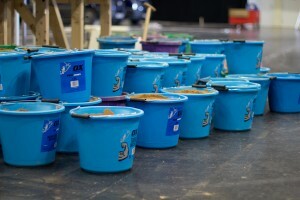 We left them at 8.30 in the evening while they were still working away, we went back to our hotel for something to eat and an early night. 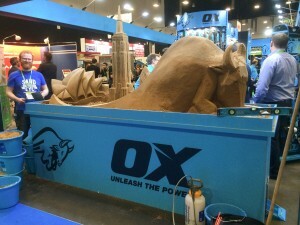 The next day Jamie began to tackle the rest of the sand sculpture and I joined him for the last hour to help complete it. 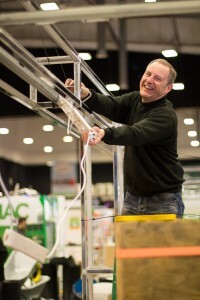 Jamie was in high spirits, he received a great reaction from everybody at the trade show and enjoyed talking to people from many different industries. 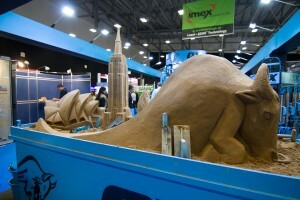 We were really pleased with the outcome of the sand sculpture and it gained really great feedback from everyone. 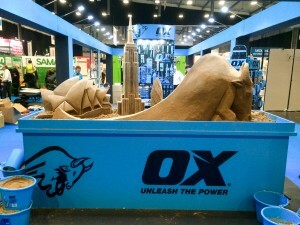 We hope to work with Ox Tools again, thank you so much for looking after us so well.